Not only are airlines particular about which types of pets they allow on board, they also have different rules about the pet’s breed, size, weight, age, and health. Leaving on Jet Blue? You might want to put your pudgy pug on a diet before the trip: the combined weight of the pet and its carrier cannot exceed 20 pounds. On Delta, pets aren’t allowed in first class; if you’re flying Southwest, get to the airport early—a total of six pets are allowed on each flight, and permission is granted on a first-come, first-served basis. To further complicate things, not only do airlines have their own, non-uniform pet policies, but several states (and some countries) do as well. Certain U.S. states require pet owners to provide a Certificate of Veterinary Inspection to prove Fido is healthy before they let him leave town; others will let him board as long as he doesn’t appear to be injured or ill. If you’re heading to Canada you’ll need proof of rabies vaccinations; if you’re going to Switzerland, your pet will be given the once-over by customs officials before you’re allowed to enter the country. Needless to say, figuring this out can be overwhelming. 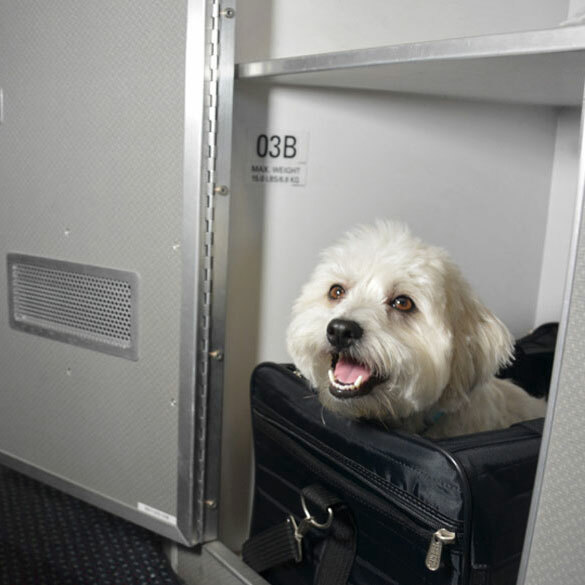 Fortunately for all two- or four-legged globetrotters, travel website Map Happy has put together a cheat sheet with the in-cabin pet policies of all North American airlines (plus a few international ones). The chart lays out which pets are allowed in the cabin and what the fees will be, and includes links to each airline’s pet policy details. Before you pack those chew toys, you might want to check it out.